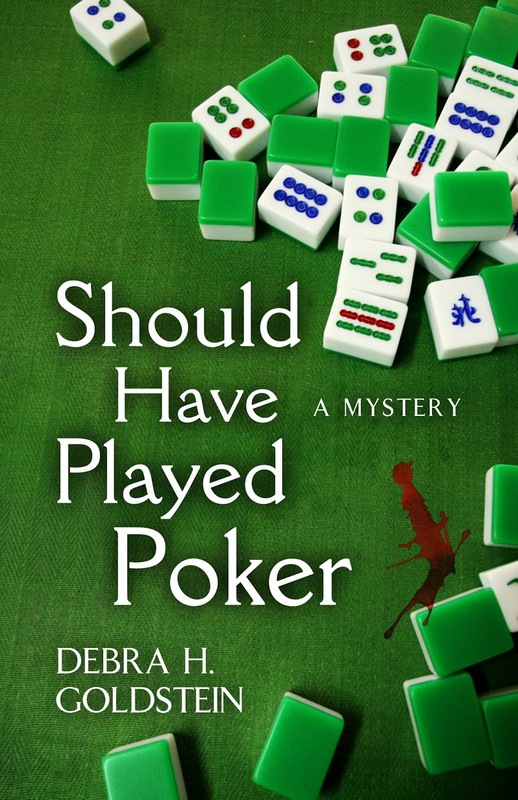 Debra H. Goldstein is the author of Should Have Played Poker: a Carrie Martin and the Mah Jongg Players Mystery (April 2016) and 2012 IPPY Award winning Maze in Blue. She also writes short stories and non-fiction. For me, the background noise when I write can best be defined as “It depends.”. Hard rock, heavy metal and rap agitate me, but songs with strong lyrics relax me to the point that my writing flows. 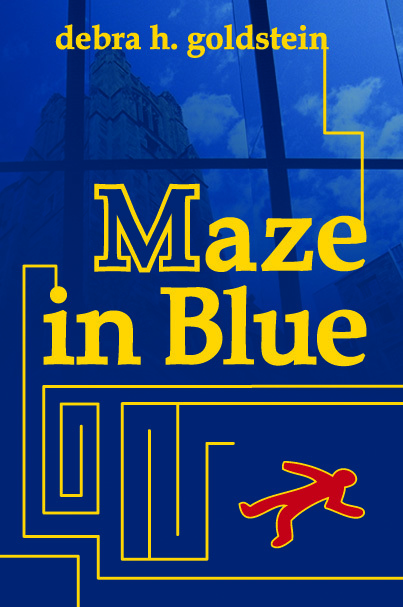 My first book, Maze in Blue, was written to the musical scores from 1776, They’re Playing Our Song and one number from Wicked. 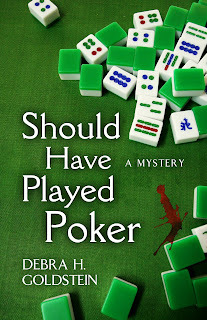 Neither those songs nor soft rock from the 60’s and 70’s worked consistently for my newest book, Should Have Played Poker: a Carrie Martin and the Mah Jongg Players Mystery. For the most part I wrote and edited that book to the sound of silence. I thought the same would be true for my present work in progress, but the words only flowed when I played the soundtrack from Frozen. I write based upon hearing a sentence or phrase in my head. If the impetus for the piece is something that works into the piece’s first paragraph, I just write, letting the characters guide me. When the idea that spurs the story is its conclusion, I outline the entire plot and write the beginning, middle and end in accordance with the outline. Although they would be enough to spend the weekend with, I think it will be very interesting to see how Abigail and Eleanor Roosevelt interact during our stay. They both are well-read, have a history of reacting to public need, and played significant roles in shaping U.S. policies. We’re expecting to have a nice weekend, but I’ve already decided that if John gets a little antsy, I’ll let him leave after dinner on Friday and substitute Hilary Clinton as the third guest. Can you imagine those three ladies together? I’ll definitely be the fly on the wall. Linda Rodriguez – Linda is both a poet and a novelist. Before writing mysteries, she had two books of poetry published and two poems read by Garrison Keillor on The Writer’s Almanac. 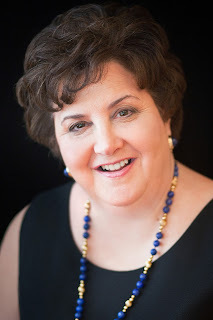 Her first mystery, Every Last Secret, won the St. Martin’s Press/Malice Domestic Best First Traditional Mystery Novel Competition, was a Barnes & Noble Mystery Pick, was featured by Las Comadres National Latino Book Club, and was a finalist for the International Latino Book Award. Her writing is tight, her characters diverse. Terry Shames – Terry was a finalist one year and won the big award at Killer Nashville another year. Her plots are intricately thought out, but her characters are relaxed. I find her main protagonist to be world weary and human, but compelling. It takes a real talent to balance a character that well. James M. Jackson – How can I not pick my host? He writes a series that creatively depicts financial issues, a character, Seamus McCree, who is flawed but human, and an interesting father/son dynamic. Not to tell a lie, Jim’s first book sat on my TBR shelf for a few months, but once I started it, I didn’t put it down. Now, when a new one comes out, I read it the day it comes. I read reviews of my books because I learn from them. 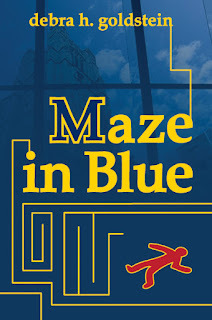 Although most of the reviews I received for Maze in Blue were positive, there were a few that contained negative comments. One felt that even though it was so well plotted that she didn’t figure it out, the language and the read wasn’t complex enough for her (duh, it was meant to be a beach read not War and Peace). One felt I had gotten the setting wrong because a road I mentioned didn’t run the way I said it did. (He was right in 2012 and even at the end of the year the book was set in because the road through campus was rerouted to accommodate the building of the dental school, but it was accurate for the dates I referenced. Even though I was tempted to post a reply, I didn’t.) Another reader wrote a great response citing my accuracy and how the book brought back memories of Ann Arbor and the University of Michigan when she lived there -- she gave the book five stars. The third negative review was my favorite. It praised certain things about the book but felt there was a place that had too much of an information dump. The reviewer was right. Consequently, I’ve been cognizant of avoiding info dumps in the stories and books I’ve written since then. There always is a net gain between my first draft and my final draft. The first draft contains the characters, plot, and setting, but I flesh them out when I revise. For example, characters may gain quirks or specific physical attributes and I definitely add more to their inner thoughts. At the same time, I subtract words to tighten the flow of the story, but the upshot always is a longer manuscript. After my first book, Maze in Blue was published, I was a panelist at Murder on the Menu, a fundraiser for the local library, in Wetumpka, Alabama. I hadn’t been to Wetumpka, but I fell in love with the town and as I drove around, I realized it was the perfect setting, albeit modified a bit, for a small town mystery. As part of the fundraising aspect of Murder on the Menu, participating authors are asked if a naming opportunity in their next work can be auctioned. I agreed. After I left the conference, having not only enjoyed it, but still being thrilled because it was the first time someone bid to have me include a name in one of my books, a sentence came into my head using the name. From that sentence, Should Have Played Poker: a Carrie Martin and the Mah Jongg Players Mystery was born. Once I had the premise for the book, I realized the young protagonist needed assistance that would showcase and balance her actions, so I reached back to the pink-haired Mah jongg ladies who appeared in my first published short story, Legal Magic. At that point, I was off and running. Easy answer – being an inconsistent dinosaur who occasionally puts an extra space between words or at the end of a sentence and who still prefers to use an extra comma in a list or semi-colon where appropriate. Understand that your words are not sacred. Revision, while often resulting in added words, means that portions that were wonderful when written need to end up in the "maybe another time" pile. Be willing to edit. Carrie Martin’s balancing of her corporate law job and visiting her father at the Sunshine Village retirement home is upset when her mother returns twenty-six years after abandoning her family. Her mother leaves her with a sealed envelope and the confession she once considered killing Carrie’s father. Before Carrie opens the envelope, she finds her mother murdered and the woman who helped raise her seriously injured. Instructed to leave the sleuthing to the police, Carrie and the Sunshine Mah jongg players’s attempts to unravel Wahoo, Alabama’s past secrets put Carrie in danger and at odds with her former lover—the detective assigned to her mother’s case. In this fast paced mystery, she learns truth and integrity aren’t always what she was taught to believe. Joanne, thanks for stopping by. It was a fun interview to do. Appreciate the good wishes on Poker, too. Tomorrow is its debut day. Interesting having a debut on Wednesday -- the traditional day has "always" been Tuesday. Comments on the reason for Wednesday? Another fun Jim Jackson interview! I want to be a fellow fly on the wall at the White House when you host there. Good luck you the debut!! Maybe Jim will let me have four guests at the White House ?????? You've already stretched the rules with you Hilary Clinton substitution. Now that is an interesting concept. I wonder who would like to volunteer to be on the wait staff? Any takers out there? Enjoyed your interview with Jim, Debra. Loved your answers, especially the White House setting with the three First Ladies. Good luck with your new mystery. I look forward to reading it. Thanks Marilyn......I always had a soft spot for the Adams family (the political one that is vs. the Addams family though I did like Lurch and the hand).....the White House setting was a question that gave me pause but made this a fun interview (as did thinking about the music I write to). Great interview! I hope the new novel sells well. If you decide to have a party at the White House during your stay (tea party comes to mind) please invite me! Excellent interview. Really like your book covers. Thank you, Kristina. I'm glad you like them. The 2nd one was done by five star but the first was an idea submitted by a college student friend of my daughter that the publisher liked enough to use.